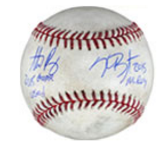 2016 Fanatics Authentic Under Wraps Series 1 Autographed Baseball is the first mystery memorabilia product to be licensed by Major League Baseball and MLBPA. Issued in a blind-box format, there is one signed baseball in every box. Similar to card releases, the MLB product is broken into several different groups with varying rarity. The 2016 Fanatics Authentic Under Wraps Series 1 Autographed Baseball Fan Favorites (1:2 boxes) set is the largest and contains 76 autographs from past and present stars. Autograph seekers can also find 37 baseballs with a little extra text, such as a stat or phrase, in the Inscription Collection (1:3 boxes). Hall of Famers (1:5 boxes) contains 37 different signers and each player has been immortalized in Cooperstown. Featuring several names on the same ball, Multi-Signed autographed baseballs surface at a rate of 1:12 boxes. These include autographs from as few as two subjects and as many as 27, usually with a team focus. 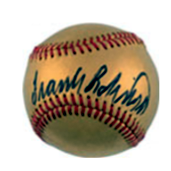 There are also 24K Gold Baseballs (1:250 boxes) that have real gold infused into the leather. Game-used memorabilia pieces are some of the most sought-after options for collectors, and 2016 Fanatics Authentic Under Wraps Series 1 Autograph Baseball brings that element into play with seven different subjects in their Game-Used Collection (1:350 boxes). Lastly, The Grand Prize (1:2500 boxes) is not a baseball at all and instead an all-expense paid, VIP experience. The winning fan will get to attend The Fanatics Authentic Sports Spectacular collectibles convention in Chicago with backstage access. 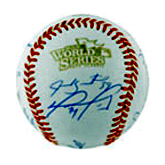 Every autographed baseball is randomly inserted and signatures are verified by the MLB Authentication Program. Each box also contains a Fanatics identification for the signed ball for another level of authentication along with a code for fans to enter into a drawing for the Grand Prize. 2016 Fanatics Authentic Under Wraps Series 1 Autographed Baseball boxes retail for $99.99 and can be purchased directly on the Fanatics site, usually with free shipping or an applicable promo code. The reported production for 2016 Fanatics Authentic Under Wraps Series 1 Autographed Baseball is 200 total cases. 11 options. 1:12 boxes. Total signatures for each ball noted below.